These songs for me are like souvenirs from a musical journey. La Kora du Sénégal - This song is named after an album I bought on impulse years ago from a sale bin. It featured the kora, a West African harp, and I've been trying to imitate it ever since. Back in Your Same Old Place - I found the title in an African-American folkloric story called "Wiley and the Hairyman." Rhythmically I was trying to channel Go-Go music, which was popular in the D.C. area at the time. Wasiokula - I was thinking of Leo Kottke, Congolese rumba, and world hunger (the title is Swahili for "those who do not eat"). Sita Nane - This is loosely based on both a blues form and an East African dance in 6-8 time called "chakacha." "Sita" and "nane" are the numbers six and eight in Swahili. Money For Your Major Boom - According to dancer/artist/songwriter Jean Ockuly who once spent an eventful couple of months there, in Guinea, your major boom is your "hustle" - the whole point of which is to make some money, right? Makwandungu - The great Minneapolis-based guitarist Siama Matuzungidi showed me this rhythm, and how to play it on the guitar. He went on to explain that it was considered a bit old-fashioned back home in Congo and that nobody played it anymore, and I said "But I will." Banjo Song - The title implies something entirely different than what it is: a slow call-and-response style spiritual, though it did begin its life as part of the slow movement of an as-yet unfinished sonata for banjo and guitar. I'm stuck with this title until someone comes up with some lyrics. The other four tunes are ones I always love to play, from four legendary Brazilian and Jamaican composers. Guitarists, the music to the original pieces in "Jocko's Yellow Album of Guitar Music" is available as well, fully fingered, in standard notation and TAB. Please check in at www.countjockula.com for more info, or feel free to e me at jockomacn@aol.com. Thanks, be well and happy. Jocko has blended the melodic influences of Africa and Brasil, added his own unique gift of interpretation and fretwork skill to produce a wonderful CD. Be warned if you use this CD for traveling you may end up singing; if you play it as background music, it will likely end up in the foreground. 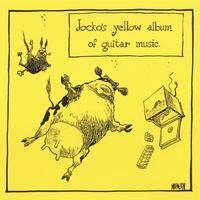 Jocko's Yellow Album is a great collection of tunes, it deserves a sequel or two. I have found this CD stimulating to listen to while cuddling with my honey on the couch, solving the world's problems with friends over dinner, or working at my computer. This music inspires us to see ourselves as members of a global community. My late husband, Walter Spalding, who was Jocko's first classical guitar teacher, would have been so proud of this CD, which sounds to me as if Jocko took what he learned and condensed it into lovely, lyrical, sensual, dynamic, eclectic, and, as Walter would have put it, "very tricky" compositions, executed with panache and a palpable sense of fun. It's wonderful to see someone writing classical guitar music that's both up to the moment and respectful of the traditions of both the instrument and the repertoire, and then playing it expertly and with complete control. I look forward to more of the same. Good, honest music, perfectly executed. Jocko’s years on ships plying the Caribbean, and exploring musical cultures in island shanties in the backwoods of Coconut Grove has served him well! But the album is so much more than a collection of island-influenced tunes. Intricate harmonies, with splashes of melody woven through delicate finger picked goodness make me have to listen closely or I’ll miss something. I also hear the hours we spent listening to Folkways records. And I guess I now know Leo Kottke DID use just one track to record his solo pieces. My hat’s off to you, my friend. I’m enjoying it very much! Good stuff. Very pleasant listening. Good Stuff, Very pleasant listening. I find the experience over way too soon. Has that much time actually gone by? It appears that my esteemed cousin has created some time dialation music. Jocko MacNelly's music is creatively original as well as good listening. MacNelly's music makes for pleasant listening, whether you are just sitting around with friends or having a party. While it's a good background for conversation it's also fun to listen to while traveling. Much beyond the same-old same-old you hear too often these days, his clever chording and innovative melody lines give each present moment a fresh start and a lyrical zing. Thanks, Jocko, I hope we can hear even more of your good music soon.